Organized by Buy a Shirt for Eric's Clay Shoot for HLH & Still's Disease and Raise Funds for HLH Today! 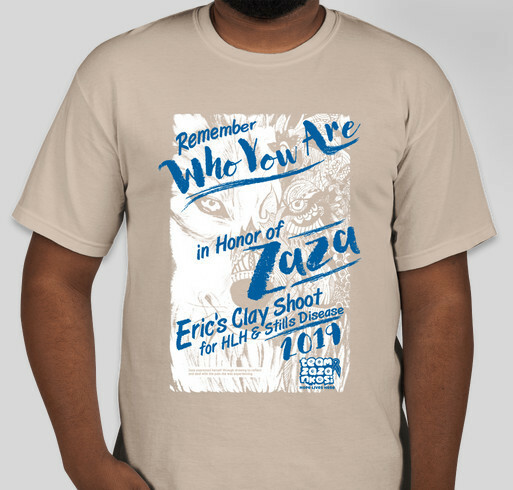 Buy a Shirt for Eric's Clay Shoot for HLH & Still's Disease and Raise Funds for HLH Today! All funds raised will be paid directly to Stanley & Daphne Nkosi Foundation for Team Zaza and the Zakithi Nkosi Clinical Haematology Centre of Excellence. This year Eric's Clay Shoot for HLH & Still's Disease is being held in honor of Zakithi "Zaza" Nkosi. Please help us honor Zaza and Eric and ALL of the HLH warriors and angels out there by buying a shirt and helping us spread awareness each time you wear it. Zaza, originally from South Africa, was studying in the UK when her symptoms first arose. Throughout her journey she not only fought against HLH, but she rose to the occasion and strove to bring awareness about HLH and the importance of blood donations. Zaza gained her angel wings on November 26, 2016. We first learned of her story from her mother Daphne a few years ago. Daphne has been so generous to send us her book Untimely Departure, Zaza Nkosi and the Fight Against HLH. Daphne has dedicated herself to opening the Zakithi Nkosi Clinical Haematology Centre of Excellence to continue the fight in Zaza's name and to provide others with better treatment options for HLH and other hematological diseases and disorders. We are honored to be joining Zaza's family and the dedicated individuals who have helped make this building a success on June 1st in South Africa. A photo of Zaza and her mother Daphne. Eric was diagnosed with Hemophagocytic Lymphohistiocytosis in 2012 after having less than a 5% chance to survive due to sepsis and organ failure. Each year we host a local event for friends and family to celebrate Eric's life and raise awareness for HLH & Still's Disease and some much needed funds for research. Visit www.EricsJourney.org for more information. I personally knew some who pass away because of HLH, and I am also an executive director of The Stanley and Daphne Nkosi Foundation. Share Why You Support "Aiming at a Cure for HLH"